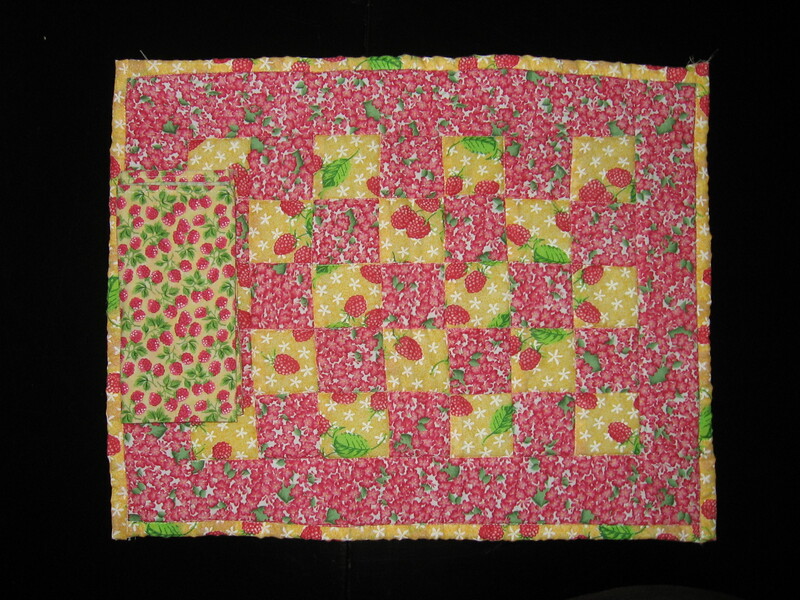 I was sorting through some things in the kitchen yesterday and I came across my first quilting project ever! I started sewing about 6 years ago and one of the first things I made was a set of placements and napkins. The fabric was something that I bought a years ago (while still in college) for project that I can’t even remember right now. The bright yellow and hot pink fabrics really grabbed my attention at the time, but for the life of me I can’t remember what I bought it for in the first place. When I received my first sewing machine for Christmas in 2003 (thanks mom! ), I wasn’t quite sure what to make with it, so it sat in the closest for almost two years (hard to believe that now)!! One day, I saw a booked called “Quilting 101” and it had directions for making these cute patchwork place mats – finally the perfect project for the yellow and pink fabric. There was not enough fabric for backing, so I just used plain muslin. The binding is not one continuous piece, instead each edge is bound separately (so the corners are now fraying and uneven). Once I got the place mats sewn and quilted, matching napkins were in order. Believe it or not, Jo-Ann’s had something that matched perfectly! I was so proud of my first project and am looking forward to using them again this spring!. What was your first sewing project? Or what project made you catch the sewing bug? This entry was posted in Household, Quilting, Sewing. Bookmark the permalink. I still don’t have the bug so I have nothing to report about any inspiration let alone any project. However, I know you have a Grandmother smiling down from heaven on you and wishing she could work with you. The place mats are very special and I never knew they were your first project. By the way, I had coffee today with a fellow from East Point, Georgia that knew your father when they were both boys.